David Lehman. 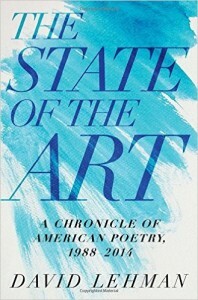 The State of the Art: A Chronicle of American Poetry, 1988-2014. University of Pittsburgh Press, 2015. 198 pgs. $24.95. 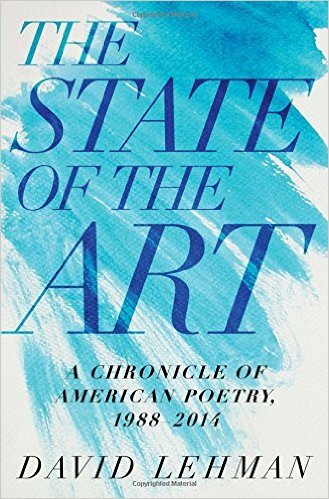 David Lehman’s The State of the Art: A Chronicle of American Poetry, 1988-2014 collects the introductions he’s written to introduce the individual volumes of The Best American Poetry series over the last twenty-five years. Taken together, these brief essays—for they are much more broadly conceived than the word “introduction” would indicate—trace the controversies and other points of attention within the American poetry world over the last quarter century. Often as I read, I thought, oh, I’m glad we’re through that phase—the theory wars that not only pitted scholars against each other but also unnecessarily pitted scholars against creative writers (as if many of us don’t fill both roles), the flurry of trash-talking reviews by William Logan, the perennial complaint that there’s too much bad poetry because of MFA programs or slam poetry events or the ease of online publishing (a discussion we’re, alas, not yet through having). More often, though, I found myself glad to be a poet in our time when there’s so much vibrant poetry being written by so many different writers, and when there’s such energetic conversation occurring in libraries and cafes and bars and, yes, universities, about our art. Too often, introductions to anthologies are written as if they are formal necessities or polite niceties that no one actually reads. Too often, such introductions fail to provoke or even inform. I find myself wishing that the five pages devoted to an introduction could have been devoted to five more poems instead. No so here. Lehman seems to think deeply about poetry every breathing day, and his thoughtfulness shows. He notices which canonical poets are exerting fresh influence on their contemporary descendants, and he notices when allusions to poetry increase in pop culture. He can speak about poetry’s relation to sit-coms and to boxing, to politics and to celebrity. In addition to the obvious fact that The Best American Poetry series has lasted now a lifetime as far as some younger poets are concerned, The State of the Art also illustrates how thoughtfully Lehman has been in selecting co-editors. The first was John Ashbery, certainly an influential poet every aspiring poet in 1988 had to reckon with; the second was Donald Hall, perhaps equally influential though his style is dramatically different than Ashbery’s. Subsequent editors have included poets as diverse as Jorie Graham, Louise Gluck, Robert Creeley, Yusef Komunyakaa, Lyn Hejinian, Paul Muldoon, Rita Dove, Robert Pinsky, Mark Doty, and many others. This list reveals Lehman’s commitment to inclusion of many stylistic preferences, to a refreshing fairness. I’m glad I’ve read The State of the Art. I’m glad The Best American Poetry series exists, even when I’m irritated that particular poems weren’t included or occasionally that certain ones were. Every year, the series alerts me to the work of poets I’d been unfamiliar with and lets me know that there’s just too much good poetry for one person to read. How could I be anything but grateful for that? This entry was posted in A Review A Week on June 15, 2016 by Lynn Domina.